A scavenger hunt is like hide-and-seek, but with a written set of clues. Companies split up into teams and receive a set of instructions (the clues) to find certain waypoints along the way. These hunts usually take place within the city, but can also be held in Central Park, inside Museums, Grand Central Terminal, etc. 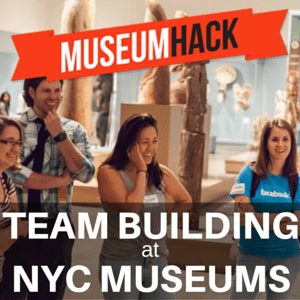 Museum Hack – Museum Hack is a highly interactive, subversive, fun, non-traditional museum tour. This isn’t your Grandma’s museum tour! Shake Rattle & Roll Dueling Pianos – Shake Rattle & Roll is a long-running, sold-out, all-request, rock ‘n’ roll party that is the largest piano entertainment company in the Northeast.